I seem to be on a Japanese drama and film binge. I cannot seem to get enough of the stuff. And it doesn’t help that you can watch so much Japanese TV (from the new to the very nostalgic 80s stuff from my childhood) with a click of your mouse pad. But, I’ve been eyeing Sakuran for a while now since it was first released in 2007. There was a lot of publicity, and although I hadn’t seen any of Tsuchiya Anna’s work at that time, I have since watched Shimotsuma Monogatari (Kamikaze Girls) which I really liked. The costumes, the visuals and the soundtrack (especially the main song by Shiina Ringo) of Sakuran all drew me to the film. 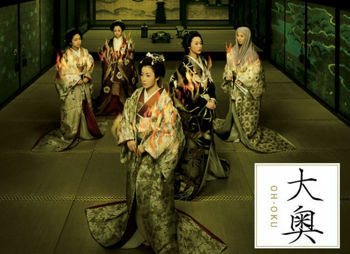 Plus I was also watching a lot of Ōoku (or Oh-Oku), a Japanese historical drama series about the great interior of the Shogun’s palace where the women resided and into which only the Shogun could enter. It was riveting stuff with lavish costumes, traps and manipulative women all vying for love and power. Based on a manga by Anno Moyoko, Sakuran follows the tale of Kiyoha who is sold to Tamagikuya, a brothel in Yoshiwara, the pleasure quarter in Edo (old Tokyo) frequently depicted in the ukiyo-e of some of Japan’s most famous artists such as Utamaro, Hiroshige and Hokusai. Once in, no woman can leave unless they have paid off their debt or their contract bought out by a client. Kiyoha resolves to leave one day when the sakura blossoms in Yoshiwara where there are no cherry trees except for one gnarled stump. She becomes a successful courtesan eventually becoming an oiran, the highest level courtesan in the pleasure quarter. Sakuran is a play on the word oiran (made up of the two kanji for flower and best/first) which substitutes the word for flower with cherry blossom (sakura). So oiran becomes sakuran. The feel of the film was in keeping with Shimotsuma Monogatari with its technicolour brilliance and a very modern soundtrack courtesy of Shiina Ringo. The directorial debut of photographer Ninagawa Mika, Sakuran is a very pop and slick film, yet it manages to retain the poignancy and bittersweet edge from which you cannot totally escape when telling the tale of an oiran. Kiyoha is such a strong character yet has a vulnerability which keeps you hoping that one day she will find happiness. You want her to succeed even within the harsh and confined world of Yoshiwara. I loved this film. It was cool and beautiful yet pulsating with energy. It’s a film about longing, and Tsuchiya Anna’s portrayal of Kiyoha is a mixture of charm, coquettishness and sorrow and is wonderful to watch. And did I mention how divine Ando Masanobu is? As well as his killer looks, his character Seiji reminded me a bit of Elizabeth Gaskell’s Mr. Thornton. Enough said. And finally, the difference between an oiran and geisha is explained here. You can see the trailer for Sakuran here. Where do you watch Japanese TV? Sakuran looks awesome! Stories about geisha/oiran/and the likes always fascinate me! I’m going to look for it. Thanks for sharing! Hi Mee, I either watch it on youtube or kimamaniyoutube (where you get longer episodes and some are subtitled). If I can, I try to buy the dvds or rent them from Japanese shops, but it’s very difficult in the UK. I know Amazon have recently started selling Japanese dvds that are released internationally and are subtitled – that’s where I got Sakuran. When I get back home (I am now on my lunch break at work) I will delve into iTunes to see if I already have the title song of Sakuran. a film made by girls, for girls. hard to imagine anyone else who could have played kiyoha’s role better than tuchiya anna. That’s interesting about the meaning of sakuran. My knowledge of kanji and my vocabulary isn’t extensive so I just thought of the simplest explanation! And it’s a surprise that Ninagawa Mika is a goth because visually there is so much colour in her work. Sakuran is quite setsunai but to me it was about people who just don’t give up.